Today at lunch is your last opportunity to get out of your 4th block class on Friday, and support a good cause! Purchase a ticket for the National Honor Society 3 on 3 basketball tournament for only $1. Proceeds will be donated to a local charity, Dream Catchers. Come discover virtual reality in the library during AEP on Tuesday, April 10th. Explore the new HTC VIVE immersive virtual reality system, or use the hand held VR devices. All interested students must sign up in the library ahead of time! Does your school day feel too stressed? Do you like puppies? If so, come participate in the Psychology Puppies Program, where you’ll get to meet and hang out with certified therapy dogs! All you have to do is pick up a permission slip from the main office and return it to Mrs. Norton in room 116. Meetings will be held during AEP on April 10th and 24th. But hurry – there are a limited number of spots available! If you have questions, contact Erin Shivers or Hallie Rubenstein. Don’t forget that New Horizons applications are due today! Please bring your completed application to the Counseling Office. Are you interested in building your cheerleading skills? Do you want to be a Lafayette cheerleader? Then come out to our cheer clinic informational meeting today at 5:30 pm in the upper commons. Please see Coach Channing in the café for more information. Would you like to get of your 4th block class on Friday, and support a good cause? If so, purchase a ticket for the National Honor Society 3 on 3 basketball tournament! Tickets are on sale for only $1 during ALL lunches today and tomorrow. Proceeds will be donated to a local charity, Dream Catchers. 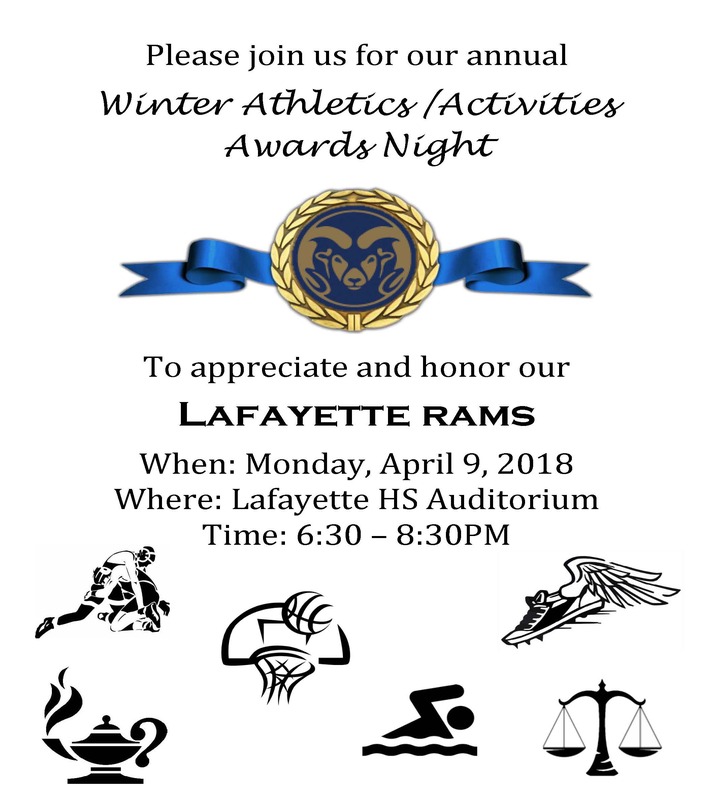 The Winter Athletic and Activity Awards Night will be held Monday, April 9th, in the Lafayette auditorium starting at 6:30 pm. 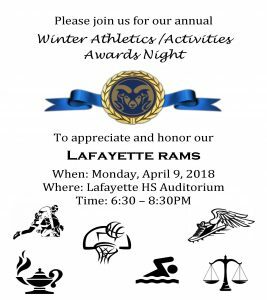 Please join us as we honor the accomplishments of the winter athletic and activity participants. New Horizons applications are due this Thursday, March 29. Please bring your completed application to the Counseling Office. See your school counselor if you have any questions. RAMS! Our National Honor Society is hosting a 3 on 3 basketball tournament to raise money for Dream Catchers. This Friday, March 30th, during 4th block, students and teachers will play basketball in the tournament. PLEASE support them by purchasing a ticket at lunch this week. Tickets are only $1.00 to see the game. Look for the NHS ticket table at lunch! Seniors: As graduation approaches, it is time to think about the words of wisdom you would like to share with your classmates, families and friends. If you are interested in speaking at this year’s graduation ceremony, please visit the LHS website for the link to the application or stop by the Main Office to pick one up. All applications are due by 2:30pm on Friday, April 13th. We look forward to hearing your ideas! Congratulations to Victoria Baynard, Astrid Stanley and Matthew Frechette for being the raffle winners of the WCF Scholarship. They were the lucky recipients of gift cards and certificates after they were randomly drawn from the pool of LHS applicants. There are many scholarships still available to apply for. Please see the LHS Counseling Scholarship website for these exciting opportunities. 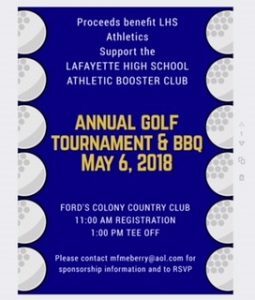 Golf Tournament & BBQ May 6. Click for more information. 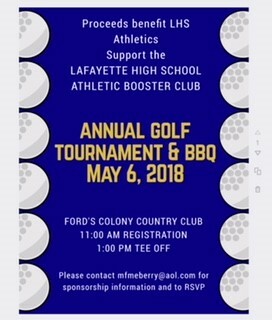 https://wjccschools.org/lhs/wp-content/uploads/sites/20/2017/10/Lafayette-High-School.png 0 0 Monica Schauffler https://wjccschools.org/lhs/wp-content/uploads/sites/20/2017/10/Lafayette-High-School.png Monica Schauffler2018-03-27 13:59:142018-03-27 13:59:20Golf Tournament & BBQ May 6. Click for more information. French Honor Society members: Today’s after school meeting has been cancelled. We will reschedule it for next month. See Madame with questions. Are you interested in building your cheerleading skills? Do you want to be a Lafayette cheerleader? Then come out to our cheer clinic informational meeting on Thursday, March 29, at 5:30pm in the upper commons. Please see Coach Channing in the café for more information. Seniors: As graduation approaches, it is time to think about the words of wisdom you would like to share with your classmates, families and friends. If you are interested in speaking at this years’ graduation ceremony, please visit the LHS website for the link to the application or stop by the Main Office to pick one up. All applications are due by 2:30pm on Friday, April 13th. We look forward to hearing your ideas! Are you interested in building your cheerleading skills? Do you want to be a Lafayette cheerleader? Then come out to our cheer clinic informational meeting on Thursday, March 29, at 5:30pm in the upper commons. If you have any questions, please see Coach Channing in the café. Today last day to register for AP exams. Any exams not ordered by today will not be ordered at all. See your school counselor if you have any questions. Today is also the last day to preorder fresh Krispy Kreme doughnuts! They are $8 a box, and will be delivered next Wednesday. Bring your payment to rooms 105 or 101 before or after school only. There’s still time to sign up for the 3-on-3 basketball tournament! The cost for a team of 3 people is $15. Look for the NHS sign-up table at lunch! 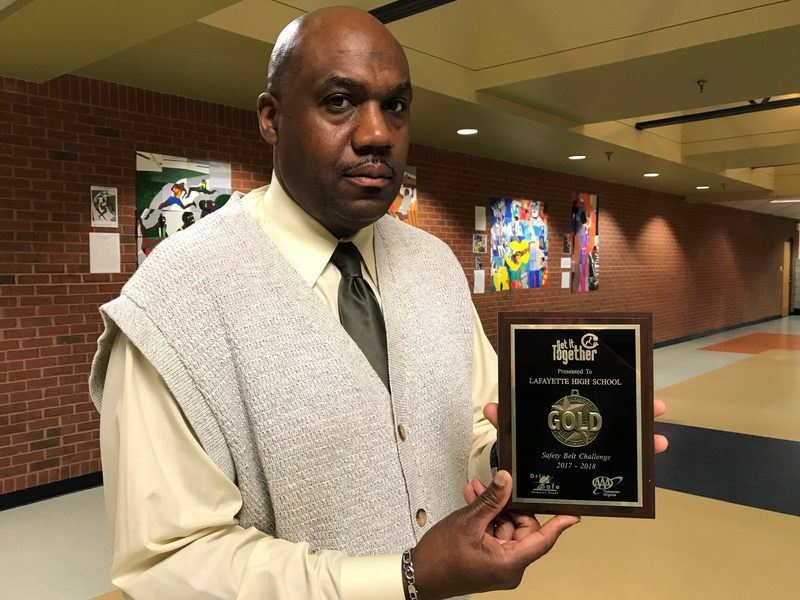 Congratulations to Lafayette High School and the driver education students for winning the gold medal in the “Get It Together Buckle UP Challenge.” Lafayette took the gold with its impressive 98.5% seat belt use. The Rams competed against 32 high schools from the Greater Hampton Roads area. Lafayette received a gold plaque and the driver’s ed students won gold medals. The students will also receive a Community Leadership Award from the Virginia Department of Education for this accomplishment. 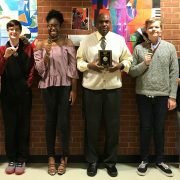 Pictured left to right: Krista Castleberry, Holden Ingram, Amiracle Felix, Mr. Hundley, Elliott Hansen and Stevie Millirons. Not pictured: Mattie Covington, Caroline Hahn, Madeleine Starr, Evelyn Arnold, and Mohammaed Khadrane. Tomorrow is the last day to register for AP exams. There is now a $10 late fee with the registration. Any exams not ordered by this Friday will not be ordered at all. See your school counselor if you have any questions. Do you love Krispy Kreme Donuts? FBLA is selling Fresh Krispy Kreme Donuts. You can pre-order now until Friday, March 23, and they will be delivered next Wednesday. Bring your $8 payment to rooms 105 or 101 before or after school only. Get your Fresh Krispy Kreme Donuts now! The National Honor Society is sponsoring a 3 on 3 basketball tournament to help raise funds for Dream Catchers, a therapeutic riding center for people with special needs. The tournament will be held next week, FRIDAY, March 30th during fourth block. If you would like to play in the tournament, sign-ups for the teams will be available this week during all lunches. The cost for a team of 3 people is $15 and your team name and uniform must be approved by NHS and the administration. Look for the NHS sign-up table at lunch! Come support our Rams!